Vitamin B12 supports the central nervous system by protecting the nerves myelin sheath, this is the covering of the nerves, and aids with heart health and digestion. A deficiency, can lead to feeling sluggish and unfocused and an increase your chances for heart disease. A deficiency can also lead to stress and depression. 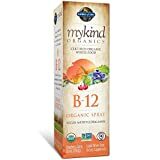 The benefits of taking B12 nutrients are increased energy, improved mood, a healthy digestive system , and it also benefits the hair, skin and nails and stay energetic all time. Consume the best magnesium supplement from here with b12 supplements for better results. Since this nutrient plays an important role in our health, lets take a look at some of the best products on the market. Jarrow’s Formulla’s B!2 is solely available in the form of methylcobalamin. Methyl B12 has the most bioavailbe type of B12, It is active in the body without having to be processed by the liver. This improves its reservation in the body. Methyl B12 aids in the promotion of good homocysteine levels. Jarrow’s Formula’s B12 uses lozenges for a simple way of receiving B12, while maintaining its bioavailability. They come in 3 different flavors, cherry, tropical and lemon, as well as 500mcg, 1000mcg, 2500mcg and 5000mcg. There are 60 lozenges per bottle and it is in the mid price range. AgeImmune’s products are doctor formulated, their Brilliant B+ formula contains complex vitamins to improve memory and concentration. It assists the brain and aids with the production of energy, the cardiovascular, metabolic, nervous and muscular systems. It also supports the formation of red blood cells. It’s ingredients include B12, B6, Folic Acid, Magnesium and Vitamin D, to aid in the synthesis of neurotransmitters, that a necessary for good neurological health.Their product is safe for vegan’s as it is gluten free and contains no GMOs, artificial fillers, yeast,preservatives or flavors. It is made in the USA, contains 60 capsules and is in the high price range. NatureMade’s Vitamin B12 aids in the conversion of food into energy, and the maintenance of good homocysteine levels, which is essential for cardiovascular health. NatureMade reports that Vitamin B12 along with other B Vitamins is important for red blood cell formation and the production of energy. It is also important for the function of the nervous system and health homocysteine levels. They say it is a recommendation for people above the age of 50, whom have a defiency, because of a lowered ability to absorb the nutrient, and vegans and vegetarians who don’t eat foods rich with B vitamins. They come in the form of micro-lozenges, with 50 lozenges per bottle, and is in the low price range. Yogabody’s B12 comes in liquid form and boasts it is an essential for vegetarians. Vegetarians need B12 supplements because they avoid foods rich in the nutrient and need to keep a healthy balance in the body. This supplement is approved by the TSA and can be taken anywhere. Their formula contains methylcobalamin which is the same form that is found in the brain. They use cinnamon, cranberry and fermented beet roots, for a great taste, along with ionic copper, as an alternative to chemicals for its preservation. This is a caffeine, soy, gluten, milk ,sugar, yeast wheat and salt free product. Yogabody offers a one year money back guarantee, with the return of the product, and is in the mid price range. Salt Lake Supplement’s VitaminB12 is in liquid form for fast acting absorption, that is more soluble than pill form, to better satiate your body. Their product helps you to get rid of that sluggish feeling, and helps keep you energized on a daily basis. It aids with the digestive system, and is non GMO and gluten free. It does not contain any wheat, yeast, milk or derivatives of milk, sugar, lactose, artificial colors and flavors or soy. They make and bottle their product in Salt Lake City Utah, and it’s third party tested. They make their products naturally with resources from the earth, and are careful in maintaining their properties. This product contains 2 fluid ounces good for 60 days of use, and is in the high price range. Pure Micronutrient’s Iron Plus supplement is created to increase energy with iron levels, with co-ingredients vitaminB12, B6, C and Folic Acid Vitamin C aids in the absorption of iron, as B12, B6 and folic acid help with red blood cell formation, for better and faster results. They boast their product is ideal for both men and women, women during pregnancy, the elderly and teenagers alike, who may suffer with anemia.Their capsule are easily swallowed with no aftertaste. Their product is mad in the USA and does not contain GMOs. There are 120 capsule per bootle and it is in the high price range. Ancestral Supplement’s Grass Fed Beef Liver is a product from New Zealand, that is pasture raised and free of pesticides, hormones and GMos. It is freeze dried to preserve its nutrients and is manufactured in the USA. It’s ingredients include Vitamin B12, A, CoQ10, Folate, Choline, Bio available Heme Iron and Hyaluronic Acid. It is good for hair skin, teeth and aids with methylation, mood,and metabolism with copper, chromium, zinc and vitamins A, D,K and E. They suggest taking their product continuously for three months for best results, if you are not happy with the results return it within 90 days for a full refund. There are 100 capsules in each bottle and the price range is high. Live Wise’s B12 Lliquid Drops helps to increase your energy, speed up your metabolism and improve your strength. It supports the nervous system and aids in brain function for better cognitive function, mental clarity and boosts the immune system. The liquid form is placed under the tinge where it is delivered straight to the body, and not the stomach, where the acid breaks down the vitamins important nutrients. The preserve their product organic grape alcohol and package it in amber glass. The organic grape improves the bioavailabily, and the amber glass keeps the sun from damaging it. It is a vegan and vegetarian safe product with no preservatives, gluten, dairy, soy, fillers, sugars or binders. Their only ingredients are organic grape alcohol, purified water and Methylcobalamin. There are 180 servings of this product and it is in the high price range. BioGanix offers 11 ingredients included in it’s B12 complex. These ingredients include Vitamin B12, to aid the nervous system, B1, for it’s neurological abilities, B6, to aid the body in turning food to energy, Riboflavin, for good eyesight, Folic Acid, to support the growth of red blood cells, Niacin, to help with digestion, Pantothenic Acid, that helps with anxiety and stress and decreases hair loss and allergies and Biotin for hair, skin and nails. This product come in the form of chewable gummies that are time released and potent. They provide a money back guarantee, it is made in the USA and tested by a third party. The packaging says there are 50 coated tablets and it is in the mid to high price range. A deficiency in B12 is considered one of the leading deficiencies today. It is a primary health concern in the USA as well as India, South America, Central America and Mexico. Animal product foods are the best sources to ingest B12, such as dairy, eggs, meat, fish poultry and meats from organs. Since plant foods do not contain a natural supply of B12, vegetarians and vegans can find themselves with a B12 deficiency. Vitamin B12 can be found in some plant foods, to a moderate degree, these include yeast and grain products, and sea vegetables. A deficiency in B12 can be hard to diagnose. The symptoms are quite common, and approximately 50% of patients with a B12 deficiency have normal B12 levels at the time of testing. Unless you have a known case of heart disease or anemia, patients will have to ask for further screenings for detection. People most at risk for having a B12 deficiency, are the elderly, vegans and vegetarians. Other groups include smokers, (nicotine inhibits it’s absorption), patient’s with digestive problems, anemics and alcoholics. Symptoms of a B12 deficiency, are joint pain, chronic fatigue, dizzy feline, difficulty breathing, foggy memory and the inability to concentrate, depression and anxiety, heart problems, poor dental health, digestive problems like nausea, cramping or diarrhea, and a decrease in appetite. We don’t need a large supply of vitamin B12 compared to other vitamins, but we need to replenish in our bodies on a daily basis. Supplements can be taken in liquid or tablet form, and are considered safe because B12 is a water soluble nutrient and any excess present in the body is flushed out. It is best to take the recommended amount of this product unless you consult with your doctor. Vitamin B12 deficiencies causes memory loss and some neurodegenerative diseases. Since it plays a rope in neurotransmitter signals and nerve health, B12 benefits cognitive function and a deficiency can lead to alzheimer’s and dementia. B12 also helps to improve mood, and aid with stress and depression. Vitamin B12 as well as Folic Acid aid in the production of S-adenosyl methionine, which plays an important role in neurological functions that deal with stress and regulating the mood. It also helps with cognitive processes and concentration. B12 helps to prevent heart disease, which could lead to a stroke or a heart attack, by lowering homocysteine levels in the blood. It also has shown to control high cholesterol. Vitamin B12 plays an important role in the health of our hair skin and nails, because it is essential in cell reproduction, it helps to reduce redness of skin and acne and strengthen the hair and nails. We hope this examination of B12 supplements aids you in your quest to being the healthiest happiest you possible. With so many products to choose from it is important to research the ingredients and benefits carefully to choose the best product to obtain your results.